Project Delivery Methods – Which Will Benefit My Construction Project the Most? All buildings are not built the same. Sure, they have foundations, a structure, exterior and interior finishes, but how the design and construction processes are managed and delivered varies from project to project. The delivery method will have a major impact on the final outcome of the project. 1. 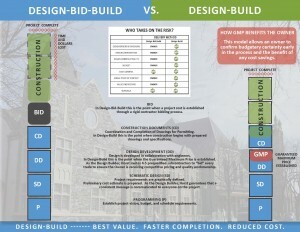 Design-Bid-Build – Using this method, you would hire an Architect, Engineers and other consultants to put together a complete design package including plans and specifications. When the design is fully complete, they are then sent out to a list of General Contractors to bid on the project based on the plans and specs you sent them. The list of contractors could be two or twenty, but the outcome is usually the same. Lowest price wins. This working relationship is totally based on price. An example of a Horst project that was completed using the Design-Bid-Build Method – Silver Spring Township Fire Company. 2. Construction Management At Risk – Using this method, you would hire a Construction Manager to act as a consultant during the design phase and then take on the role of General Contractor during the construction phase of the project. You as the Owner would still hire the Architect, Engineers and consultants separately, but you now have a construction advisor at the table. The CM usually offers pricing and practical advice during the design phase, but they are still just an advisor. During construction they act as General Contractor which again is based on the price of the documents. 3. Design-Build – Using this method, you would hire a Design-Builder to act as the designer and builder for your project. This would be a single contract where you as the Owner procure the design and construction services under one entity. There will be an Architect, Engineers and other design consultants involved, but they fall under the responsibility of the Design-Builder and not you as the Owner. Limited options on who you can hire for this method – must have experience! As a successful Design-Builder, Horst Construction can expand on our experience, the benefits regarding the Design-Build Delivery Method and how it can work for your next construction project.